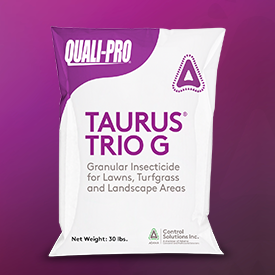 Taurus® Trio G Three-way Granular Insecticide delivers quick knock down of fire ants, mole crickets, nuisance ants, fleas and ticks while providing long residual activity. Can also be used for fire ant mound treatment, perimeter and boundary treatments. Contains 0.0143% Fipronil, 0.23% Bifenthrin, and 0.059% Lambda Cyhalothrin. Available in 30 pound bag.